Discussion in 'Muppet Appearances' started by AndyWan Kenobi, Nov 4, 2003. My Tivo's program guide (which has a wishlist for ) has just let me know that Kermit and Piggy will be appearing on Hollywood Squares the week of November 17th-21st as part of their "Dynamic Duos" week. Just thought you all might like to know. I hope they don't put Piggy and Kermit in one of the top corner squares. The last time they did that Piggy karate-chopped Kermit right out of the square! Actually, I missed that. I only hope they'll be put in a spot where they get picked a lot during the game. I'll have to remember to tape the show, since now I'm not usually around when it's on. The center is the only square that's 'more likely' to be picked. All the others are a pretty even chance. Well, remember when Kermit and Piggy were on the show a few years ago and Piggy was in the center with Whoopi? I'm hoping they'll do something like that again. That way she'll get picked more often. Just a reminder Kermit and Miss Piggy will be on Hollywood Squares all this week. Let us know what you think of Kermit and Miss Piggy's appearances all this week! D'OH!!! I missed it this morning. sigh. I'll have to catch it tomorrow. Looking forward to it, and so is my Tivo--there are five happy little "Hollywood Squares" entries in the "To-Do List"
According to Peter Marshall (the original host of Hollywood Squares) the spot that usually got called on the least was the bottom center square, which was referred to as the "lox box", so named because most of the time the star just sat there for half an hour like a lox. Hopefully Kermit and Piggy will get a better spot than that! OH NO! I forgot to watch!!!! AGGG! !I missed it, but hopefully I will see the recorded episodes the next time I will be at home from college...which is this weekend, so I won't have to wait too long!!YAY!! Okay, so who else is loving Piggy's hair? Especially in the opening, it is tres hot. Well, sure they've gone further than that, but I guess it bothered me because it involved Big Bird. 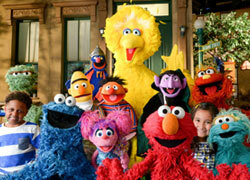 The Sesame Street characters have a kind of innocence to me, so it just rubbed me the wrong way. I agree about Piggy's hair, though. Looks good. I know PAX sometimes show the reruns from ABC but at what time? I missed it to. Man when I don't recall someone reminding me I get frusated. I Need a alram that says MUPPETS SHOWING TODAY ON HOLLYWOOD SQUARES!!! I remember to record the other episodes. Piggy's jokes were bombs. It was like Eric was trying to make them but couldn't pull it off. Oh well...at least Steve did his best at saving em'. Now, you know who would have been hilarious on this? Statler and Waldorf. That would be one hilarious week. Woah, S&W is a brilliant idea. 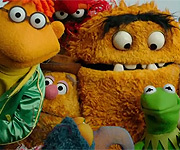 Almost everybody knows them, even non Muppet fans (the two old guys in the box). Also, why hasn't Fozzie been on with Kermit yet? They seriously desereved to be paired up again. I miss them together. I taped it and am watching it as we speak. I didn't get to the Big Bird comment yet, but it's good that Kermit and Piggy were picked first for a change. I liked Piggy's line: They sound like real losers if you ask me. I'm looking forward to watching more of it. Yeah, it would be good to see Kermit and Fozzie together, but how many talk show/game show appearances has Fozzie really had? It seems like Piggy is a much more popular character. Seeing Statler and Waldorf on the show would be good, if Steve or Bill performs Statler. After all, they appeared with Kermit on the Jimmy Kimmel show.